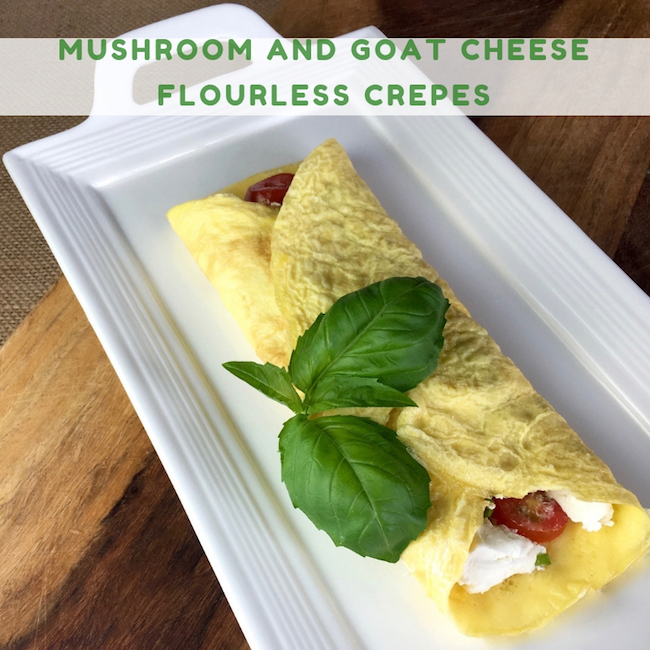 Mushroom And Goat Cheese Flourless Crepes are low-carb, gluten-free wraps that are perfect for those busy days where you need a quick and tasty dinner. This versatile recipe also works well with other savory ingredients. 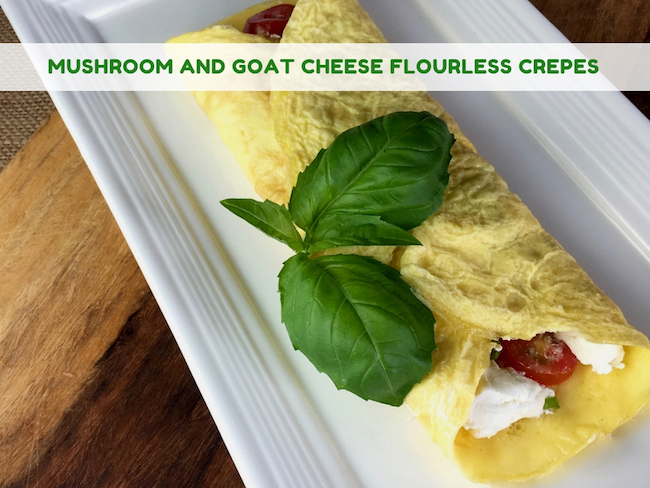 Traditional crepes are a popular French dish made with a combination of flour and eggs. 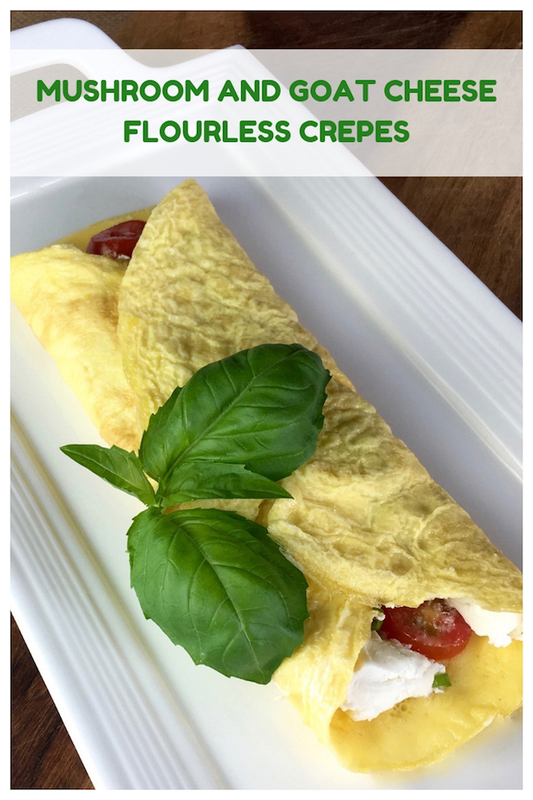 This extremely versatile, gluten-free version omits the flour and yields delicious low-carb wraps you can enjoy as is or with your favorite savory fillings. Add some leftover ingredients from the fridge and you have a quick and tasty lunch. Grilled steak, roasted chicken and roasted veggies are just a few items that work well in this recipe. Place the eggs, half and half, and olive oil into a large bowl and whisk until smooth. Season the batter with any desired savory ingredients. Pour ¼ cup of egg batter into pre-heated skillet and swirl pan to evenly coat the bottom with a thin layer. If any holes appear, add a little more batter to fill. Cover the pan and cook until the egg batter begins to set, approximately 2-3 minutes. Do not overcook. Place desired filling ingredients in the center of each crepe and fold over both sides to cover. Place the eggs, half and half, and olive oil into a large bowl and whisk until smooth. Season the batter with any desired savory ingredients. Lightly spray a 10” non-stick skillet with non-stick cooking spray and set over medium-low heat. (You may want to adjust heat up slightly to just below medium). Pour ¼ cup of egg batter into pre-heated skillet and swirl pan to evenly coat the bottom with a thin layer. If any holes appear, add a little more batter to fill. Cover the pan and cook until the egg batter begins to set, approximately 2-3 minutes. Do not overcook. Once set, gently loosen the edges with a silicon spatula and flip the crepe, being careful to not break or tear it in the process. Cook for one minute more and remove crepe from pan. Repeat with remaining batter. Place desired filling ingredients in the center of each crepe and fold over both sides to cover. Serve immediately and enjoy!